I did some no-line coloring on the cute couple from Avery Elle's Dreamboat set. I have them taking a Venecian gondola ride at sunset - nothing more romantic, right? I did some ink blending on the card base, and then cut a heart into my wonky stitches rectangle layer. 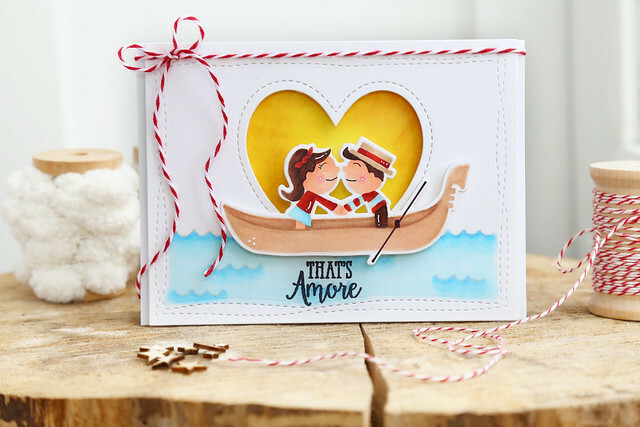 The couple was stamped with memento desert sand ink, and then colored in with copics. I drew the face and the oar back in with a copic multiliner pen. 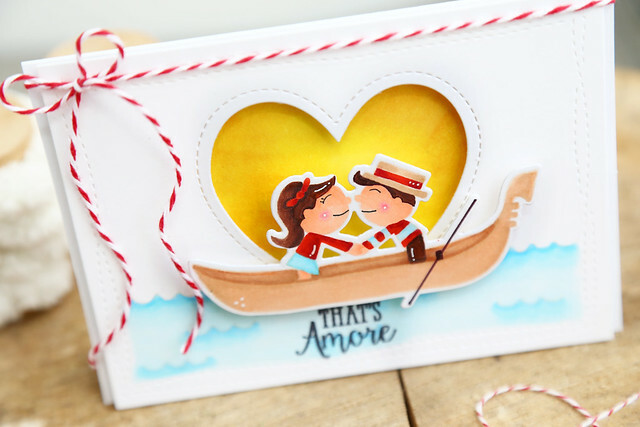 The couple was die-cut and propped up over the heart. Hi there! This is my second post today. If you're looking for my Lawn Fawn valentines, click *here* or scroll down. 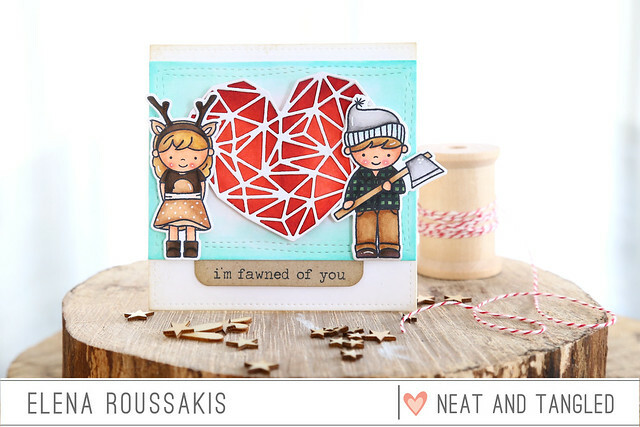 I have 2 cards to show you using Neat and Tangled's Lumberjack Love set. As soon as I got my lumberjack in the mail, I knew I would pair it with the Heart of Gold die. 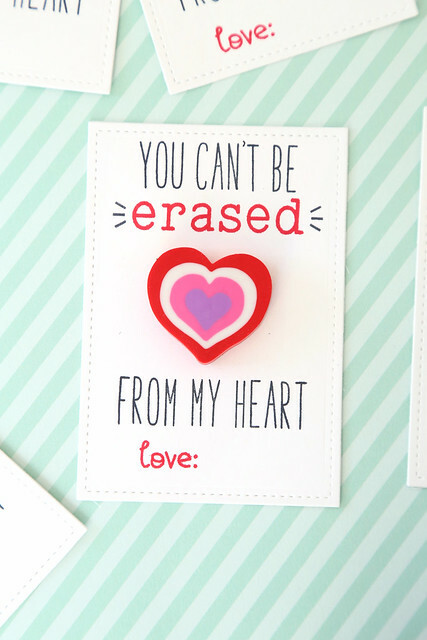 I die-cut the heart die twice, both times out of white cardstock. I punched all of the pieces out of the first layer, and set them aside. I kept all of the pieces intact for the other heart and used copic markers to paint a rich red. For my second card, I did some masking to create a little forest of trees behind the lumberjack. I then stamped, colored and fussy-cut the bear and propped him on top. I love that the bear is like his wingman here. ha. He needs his buddy there for moral support in case his valentine turns him down. 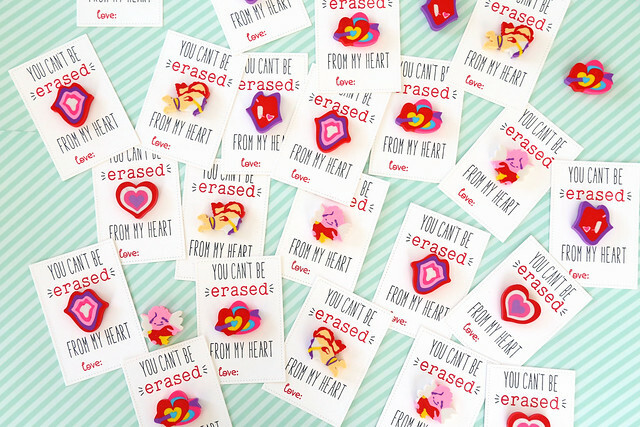 I promised easy valentines all week, and these are the easiest! And the MISTI tool. Did you know Lawn Fawn started carrying it? I never knew I needed it, but it kept everything lined up so perfectly and I could talk on the phone while slapping the acrylic cover over again and again. No concentration required. I love it. First of all, stamp everything that will be in black using Milo's ABCs. Then, what's in red, using Clark's ABCs. The extra accent framing the word "erased" is from Party Animal. Do it, times 30. 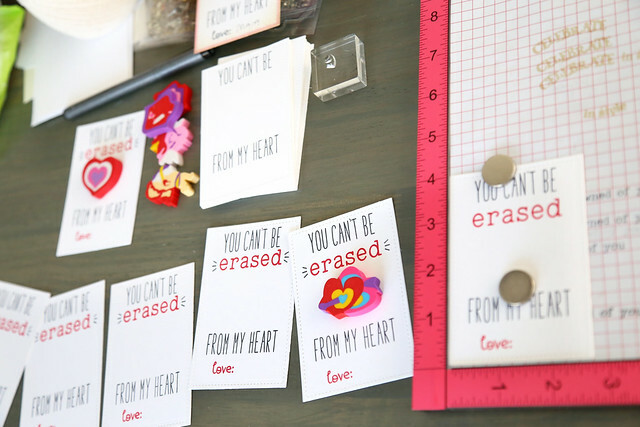 Stick the erasers to the cardstock using glue dots. My little cupid just has to write her name. 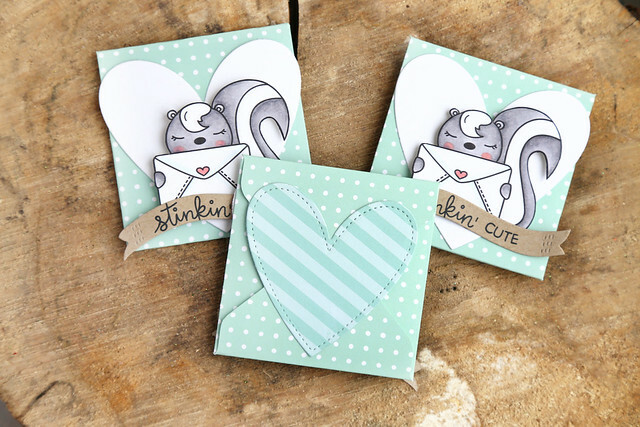 What goes better with a cute skunk image than scratch 'n sniff stickers? I do have to rant about how sticker companies sell package and sell their sheets. I have 3 kids. I wanted to divide the scented stickers 3 ways. But they are not laid out in a nice, grid pattern for me to cut. boo! To solve the problem (and listen, it's only my problem because I like things all nicely cut and square. If it doesn't bother you to have wavy cuts around the stickers, then disregard my rant,) I glued a square of wax paper onto a piece of white cardstock and cut an even square. Then, I was able to put the stickers onto the wax paper. 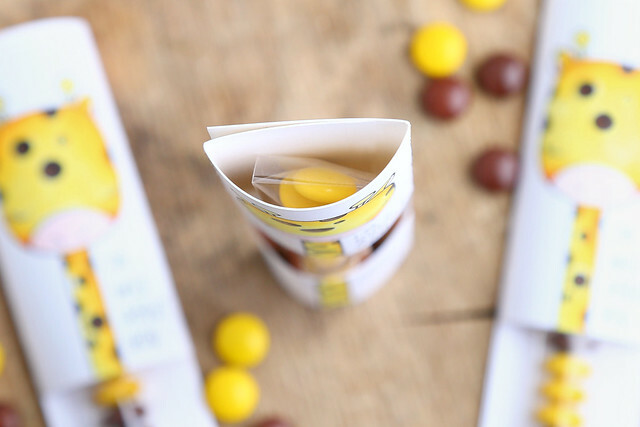 The kids will be able to use them as well as if they were opening the package themselves. To finish off, I used a 2-way glue pen to create a seal for the back. By waiting until the glue dried before sticking, the glue isn't permanent. They can open and close their envelopes without damaging it. 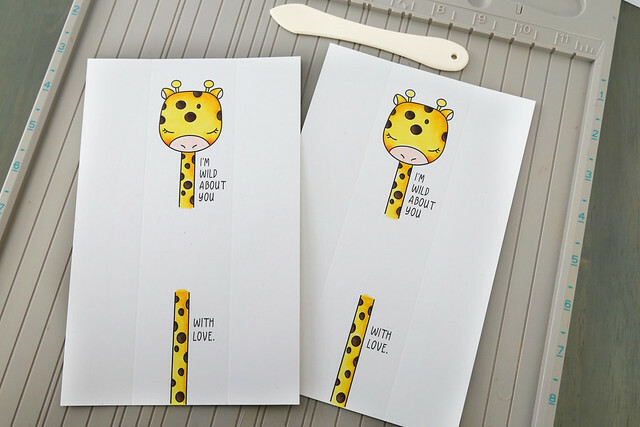 I created a few long-necked giraffe valentines using the giraffe digi stamp from my shop, by just folding white paper and cutting out a window to show the chocolates. Let me show you how. 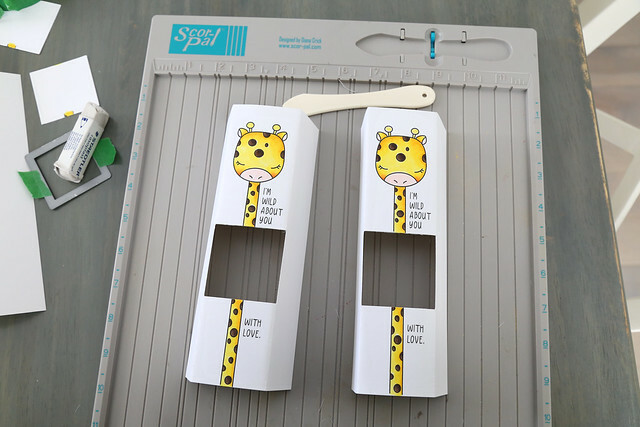 The first step is to format the giraffe. 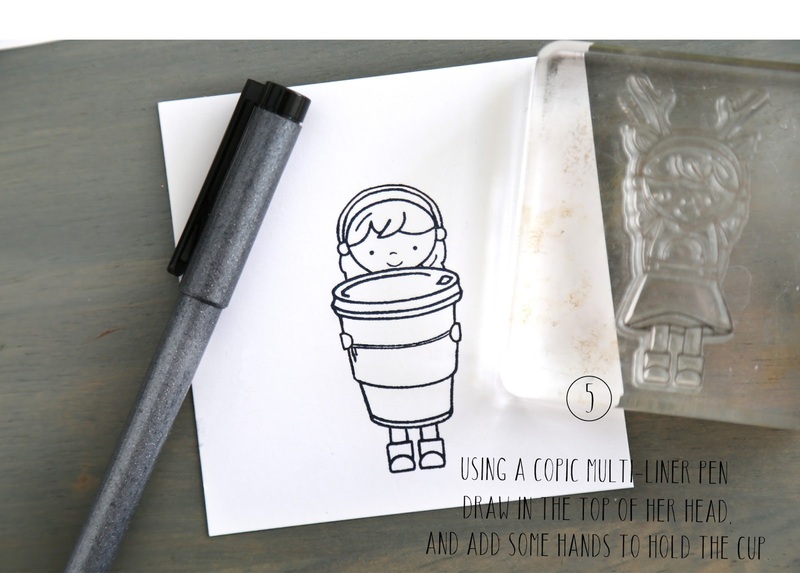 Just a note: my digi stamps don't come colored! I printed it out in black and white and used copic markers to color him in. I often get asked which yellow colors I use. Here, I used Y02 as a base color, and Y17, Y18 to add the darker shading. I filled 1x8 inch treat bags with an M&M mix, but I made sure that the orange ones wouldn't be seen in the window. They aren't the right color! I've had these treat bags forever, and I can't remember exactly where I purchased them. I used a steel die to cut out the window for my project. The die was 2x2inches, which is why I wanted 2 inches between the score lines. Also why I left a 2 inch gap between the giraffe's head and the rest of his body. If you're handy with an exacto knife, you don't even have to think about all of this. Just cut your window whatever size you like! 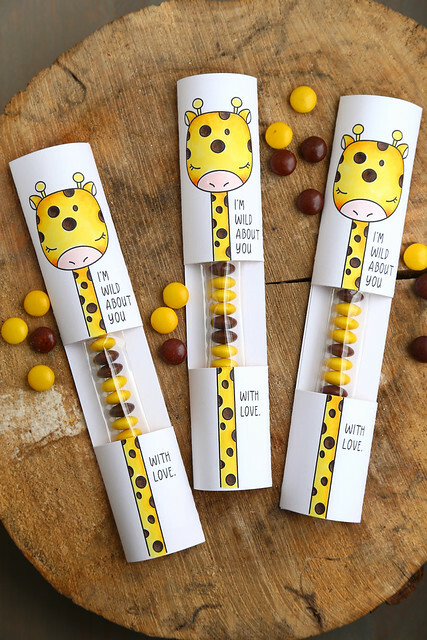 tape the candy bag to the inside (so that it lines up with the giraffe's neck and stays put) and fold in the 2 sides. It's seriously that easy! 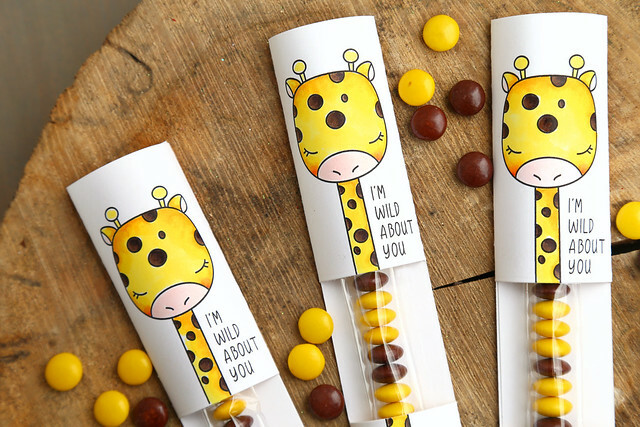 The most time-consuming part was coloring the giraffes, but that's only because I wanted to make them pretty for you. 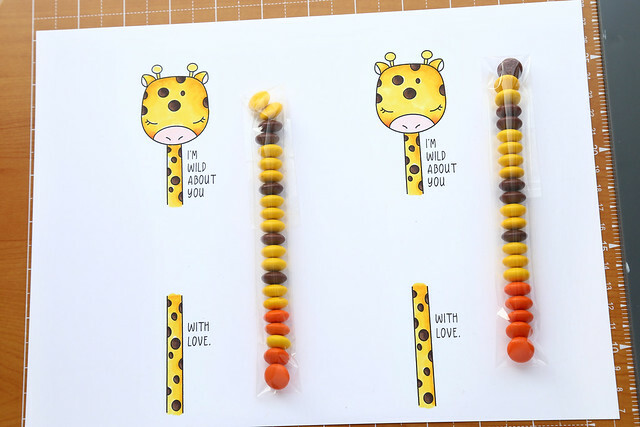 These would make cute class valentines! In that case, it would be my 5 year old with pencil crayons. ha. quite fawned of you +lumberjack love winner! 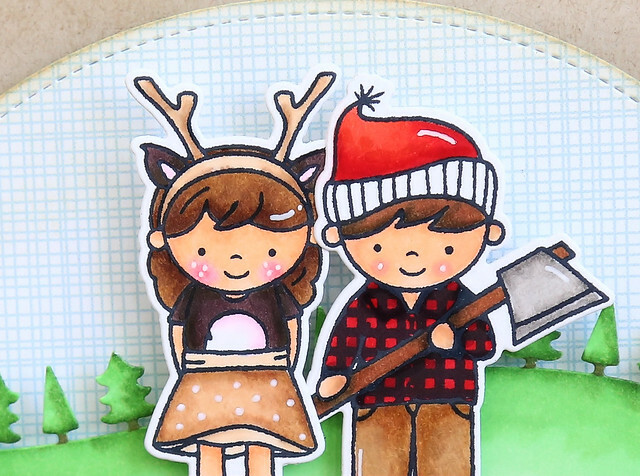 I have one more lumberjack card for you, because it occurred to me that I haven't shown them off as a couple yet! The little lumberjack and his dear (deer?) were drawn to be a valentine pair. I used some Lawn Fawn dies to create a landscape background, and framed them out with little sprigs from Send Pretty Mail. Congratulations! Shoot me an email at mom2sofia@gmail.com and we'll get that set mailed out to you. If you didn't win here, you could still be a winner on the Neat and Tangled blog - click! This my second post today. If you're looking for my Neat and Tangled card, click *here* or scroll down. 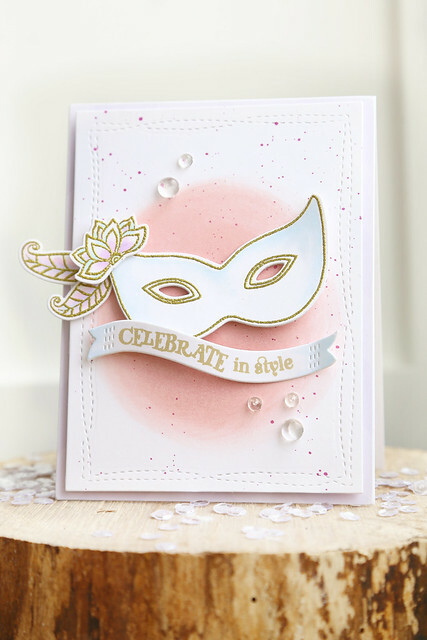 I'm on the Avery Elle blog this morning, with a little Mardi Gras card. The stamp may be called: Mardi Gras, but I am a huge Phantom of the Opera fan. I saw a matinee perfomance on a class trip in the 8th grade, and I was hooked. I still know all the words. Running through my mind right now: masquerade, paper faces on parade. hide your face so the world will never find you. My teen angst loved the anguished drama. 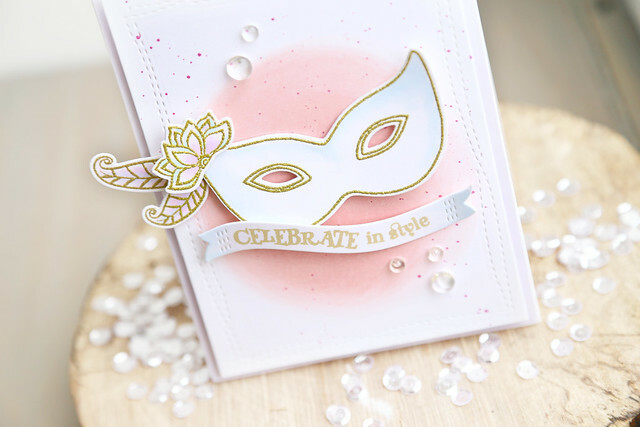 I wanted to incorporate the level of mystery and elegance and opulence that I remember from the masquerade ball scene in Phantom, so I opted to heat emboss the images in gold, and give them just a whisper of color. To create the background, I rubbed pink ink in a circular motion on my white card, and flicked on some purple ink over top. I die-cut that mat using the wonky stitches larger rectangular die, and used the sentiment banner from that set as well, to house the greeting. Some clear droplets from the Pretty Pink Posh store were the perfect, subtle embellishment. 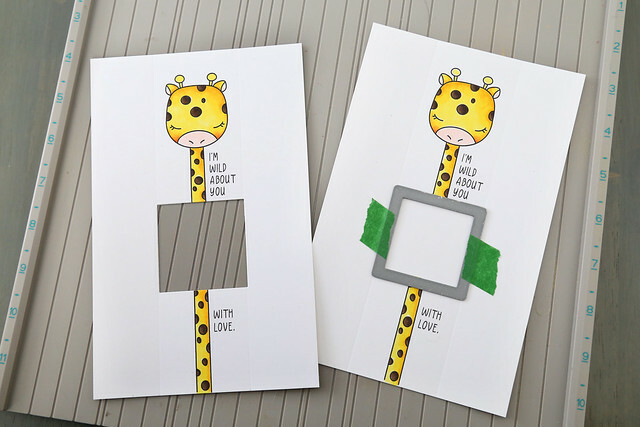 Today, I'm showing off the new multi-step mini greeting set: Painted Hello. I know what you're thinking. It doesn't look very multi-step-stamped, does it? I opted to use the full "hello" on its own, because I think it's so lovely just like that. I know I will be using this Hello again and again for sure! The Wholehearted Cover Plate looks so cozy with a buffalo check paper peeking out from behind the open hearts. To carry the woodsy, cozy theme further, I added the little bear from Lumberjack Love over the sentiment. I stamped the bear twice to achieve this look: one bear was stamped and die-cut, and the other stamped and fussy cut. Cutting the bear out by hand allowed me to dangle his arms over the sentiment, but I liked the pop of the white die-cut outline behind his body on top. 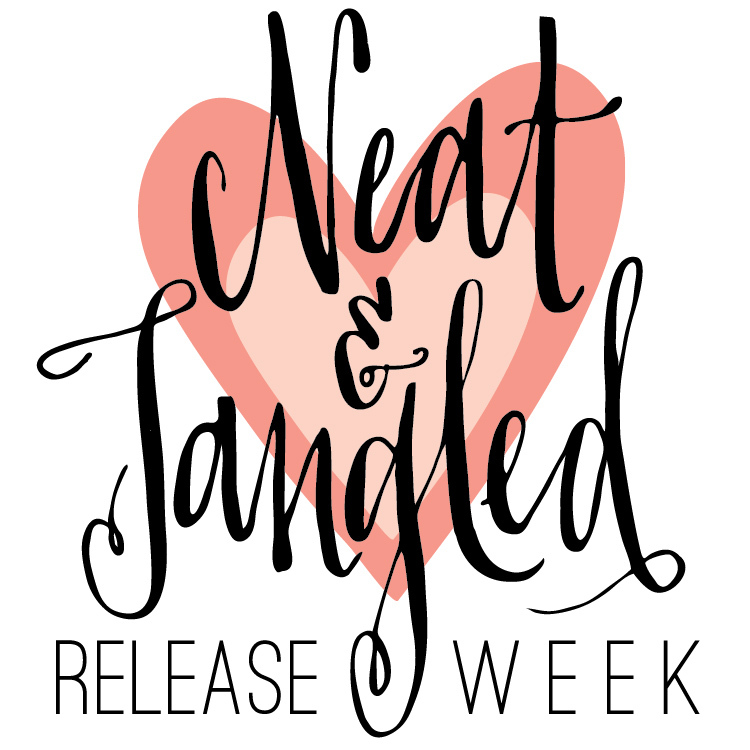 We're at the halfway point for Neat and Tangled's January release week. I hope you like what you're seeing so far! All of the sets and dies will be available in the store as of this Friday, January 22nd. 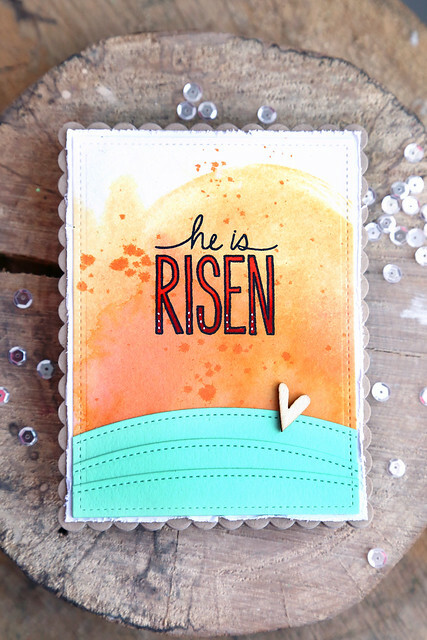 Today, I have 2 cards to show you using Easter Journaling, a set designed by my good friend Miriam Prantner. My first card uses the set as it was intended, for Easter. I love the lettering in this set, and I sorely needed to add something like this to my Easter collection. I have enough bunnies and eggs (which I adore) but I do want to make cards to give out to church ladies and this may be more appropriate. 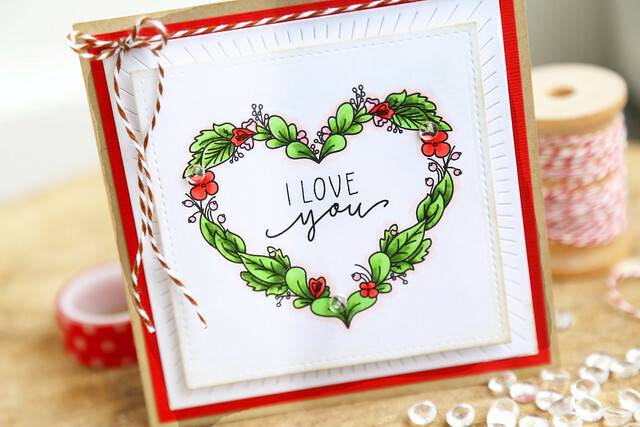 I love that the letters are so big that I don't need to add an image, that they can be the focal point of the card all by themselves. I watercolored an orange and yellow sunrise, and added minty rolling hills underneath. The lettering was colored in red, and I added little white accent dots to the letters. 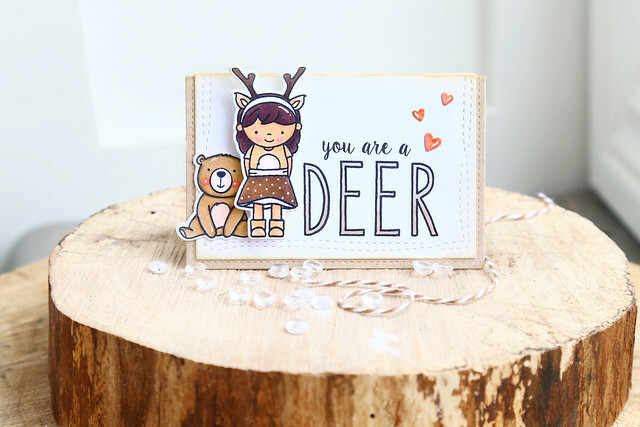 I used "you are a" from Little Angel, and selectively inked up letters to spell the word "deer." (I did have to borrow the "D" from Miriam's matching letter set, Bible Journaling.) The deer is, of course, the little girl from Lumberjack Love. I colored her to look like she's in a full deer costume, with her fuzzy white deer belly and everything. Her sidekick bear is there because he's just too cute to leave out. I hope you like what I've crafted for today! There's more to see on the NT blog this morning - click! 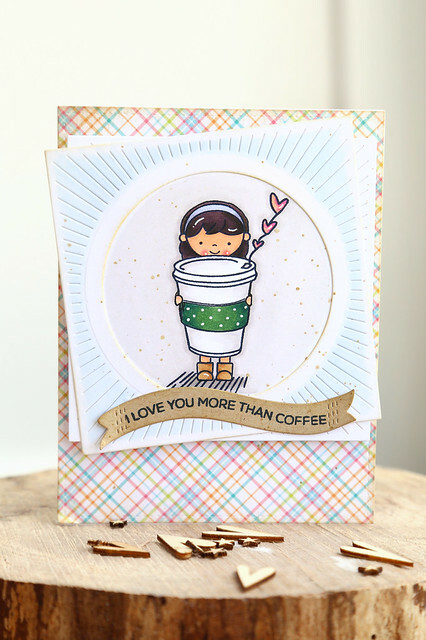 And if you haven't already, visit *this post* and comment for a chance to win your own Lumberjack Love stamp set. 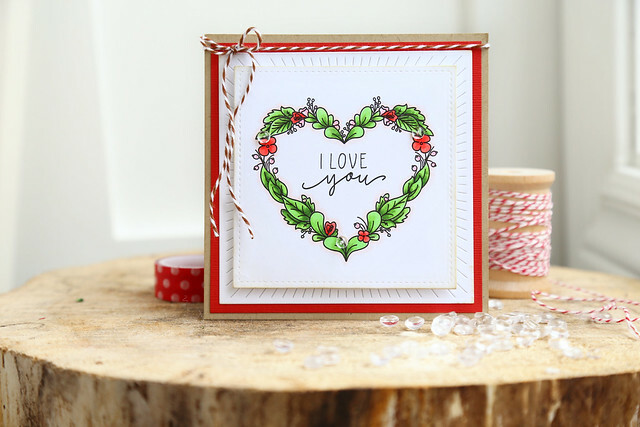 It's release week over at Neat and Tangled, and I have a card and a photo tutorial to share with you today. 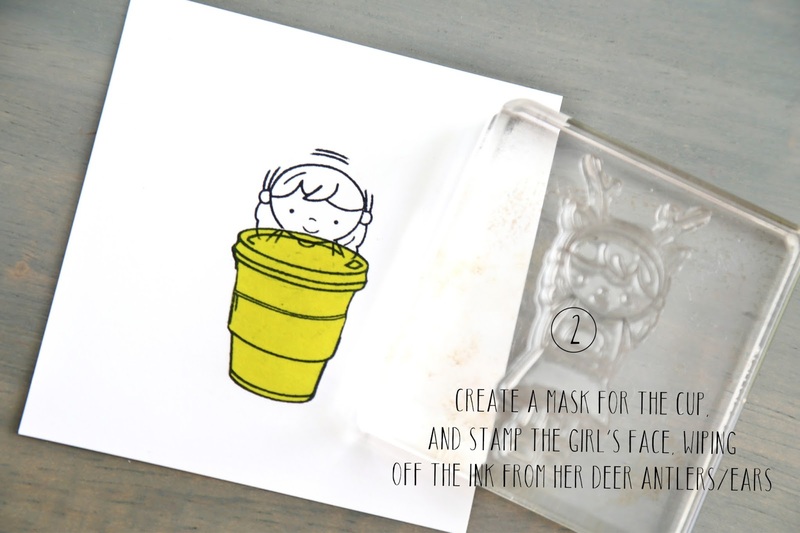 I couldn't help but use my little deer girl, from Lumberjack Love and the travel mug image from Perfect Blend to create a fun little image. 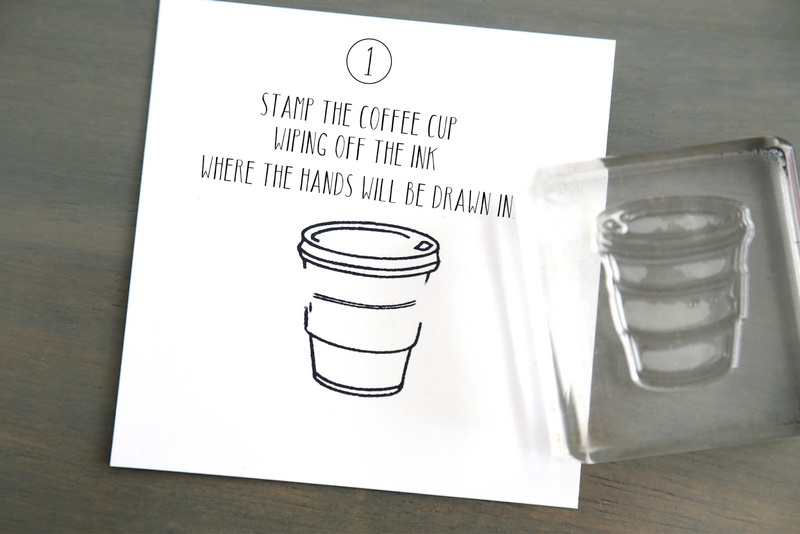 Stamp the coffee cup, but wipe off some ink on both sides where you will draw in the hands. 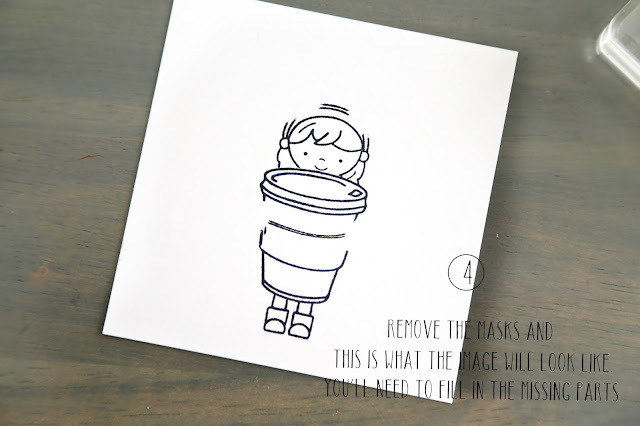 Stamp the coffee cup onto masking paper (or a post-it note) and cover the stamped cup image. Then, ink up the girl's head, carefully wipe off the ink from her deer ears/antlers and stamp her peering over the top of the cup. Clean off the girl stamp (so you don't mess up the head area you just stamped.) 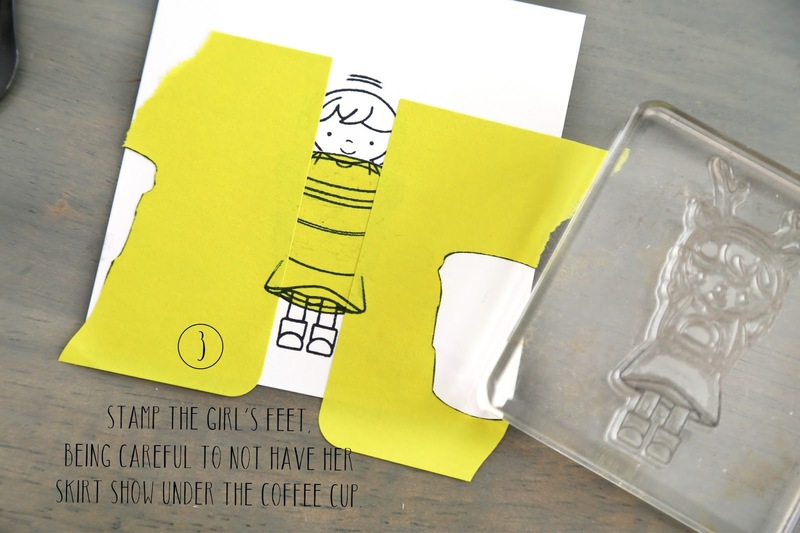 Then, ink up only her feet and stamp down under the cup. I used post-its to block off the sides, so her skirt wouldn't show. Remove the masks, and you're almost done! It's time to carefully fill in the missing parts. Use a copic multi-liner pen (my tip was a 0.3 thickness.) If you're nervous about using a pen straight onto the paper, pencil in your lines and then trace them with the pen. You can easily erase the pencil lines afterwards. On my card, I added other elements from Perfect Blend: the string of heart steam, and the lines to ground the image. I hope you like it! There's more to see on the Neat and Tangled blog this morning - click! DON'T FORGET: there's still a few more days left to enter my Lumberjack Love giveaway! Comment on *this* blog post for a chance to win. I am so excited to get this week started. 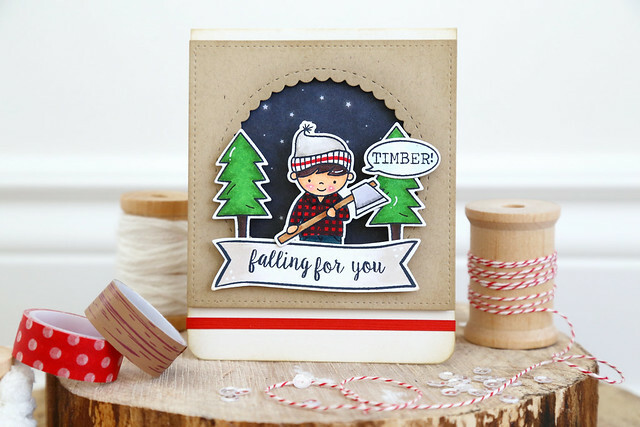 This is my first post as a part of the Neat and Tangled team, and it's a special treat for me that it happens to be the day we're showing off my new set, Lumberjack Love. 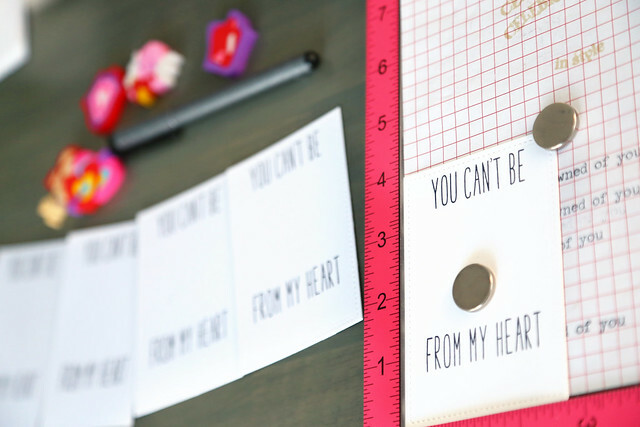 The set is perfect for Valentine's day, but the images can be used year-round. My first card features the lumberjack, in a bit of a diorama scene. I stamped, colored and cut out the lumberjack, the trees, and sentiments and popped them up against a night sky patterned paper. I grounded the entire scene by stamping the "falling for you" sentiment into the banner from Party Dots. I colored his hat to look like those really chunky working man socks. You know the ones? I always think real man when I see those. Strong, woodsy, cuts-his-own-trees, lumberjack man. ha. 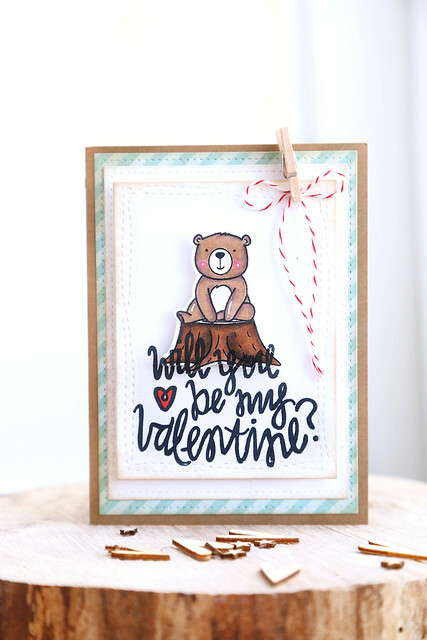 For my second card, I stamped the bear onto the tree stump and die-cut the 2 images together. I then stamped Danielle's handwritten sentiment (isn't it so lovely?) onto both the bottom of the images, and onto the white mat underneath. I love how the little bear is playing with his foot (paw?) My kids always sit like this, with one leg tucked underneath. Why not draw a bear that looks as innocent as they do when they don't know mama's watching? GIVEAWAY: I hope you're falling for Lumberjack Love! I have an extra set to give away to one of you! Leave me a comment on this post, and I'll choose a winner by Friday. 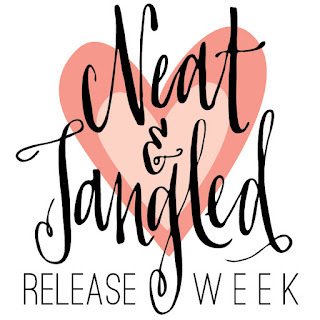 For an extra chance to win, visit the Neat and Tangled blog today. Danielle is also spreading the lumberjack love! 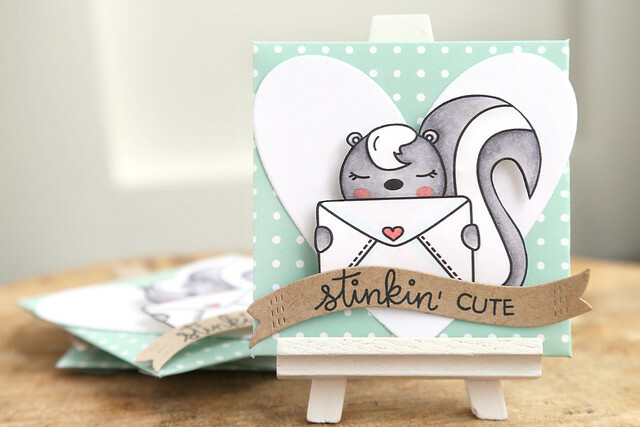 All of the stamps and dies for Neat and Tangled's new release will be in the shop by Friday, January 22nd. I'm excited to join Pretty Posh Pink for the last day of celebrating their 2nd birthday. Paulina is the sweetest person, and it's been such a joy to watch her launch and grow a successful business over the last few years! I love Paulina's sequins, but I adore her dies! I used the storybook 3 and scallop frame dies on this card, as well as clear sequins and clear droplets. 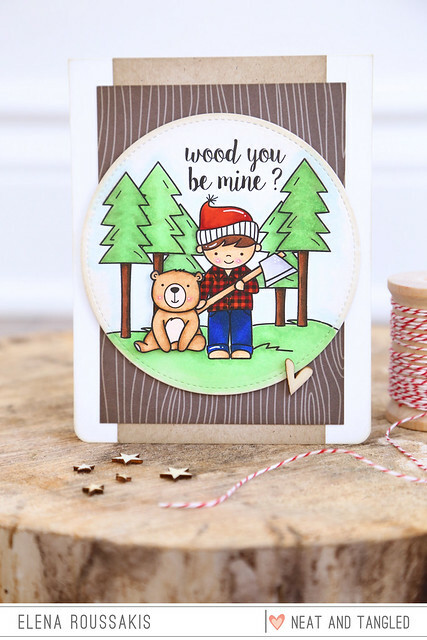 I am so excited for you to head over to the Neat and Tangled blog and see the full reveal of the first set that I've illustrated for them, Lumberjack Love - click! I've been sharing some sneak peeks on instagram this week, and you'll see samples on my blog all week starting monday. The NT January release will be available for purchase next Friday, January 22nd. 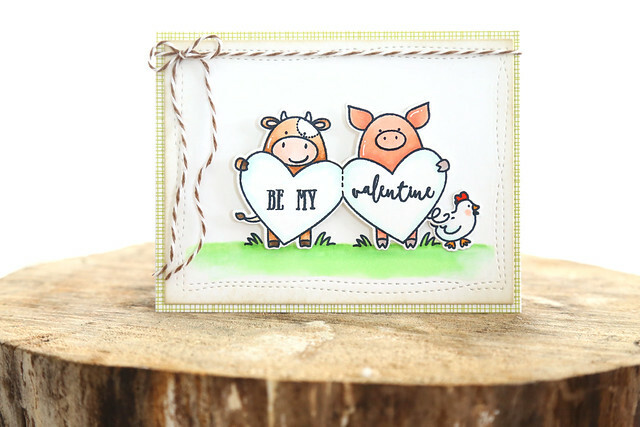 I have a fun valentine's day card to share with you today, courtesy of Avery Elle's Hogs & Kisses set. 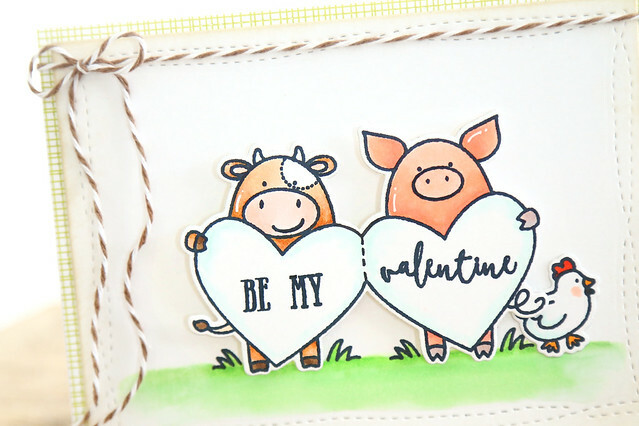 I stamped the cow, but not all the way - that is, I wiped off the ink on the right side of the heart he's holding, and then stamped the pig. Same deal with the pig - I wiped off the left edge of his heart, so that they could hang out today. Wouldn't this be amazing if you stamped out a long chain of them? Kind of like those paper doll cut-outs. I was too lazy, but that would blow my mind. If anyone tries that, tag me in your photo for sure. Once the images were stamped, I used the partial die-cut technique (where you cut out your 1st image partway, and your second image partway and then fussy cut what's left in the middle) so that I could pop the image up. The little chicken wandering around in the background kills me. 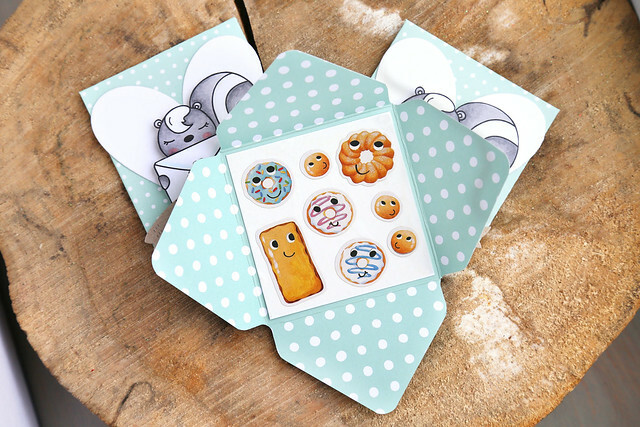 I used the wonky stitches rectangle dies as a base for my images. I love how the stitching lines frame out a simple scene and give it a little something extra. On the card base, I used some patterned paper from the Everyday Collection. Congratulations, Paulette! I see your email address in the comment, so I'll go ahead and send you the stamps! Thank you so much for all your support and comments and encouragement this week. 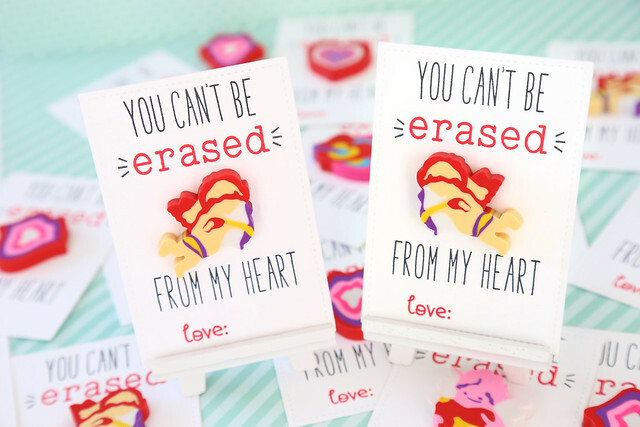 There's still time to enter my instagram giveaway for the entire valentine's collection of digi stamps! Look for the card with the 2 cheesy mice and comment for a chance to win. While you're checking out my instagram feed, let me know what you think of my little lumberjack image! 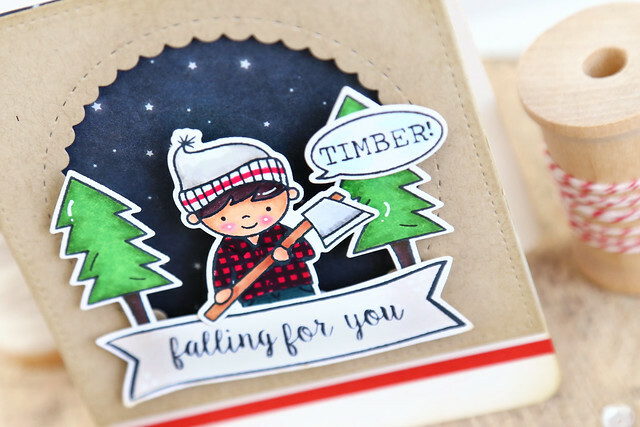 He's the star of Lumberjack Love, a new stamp set that I illustrated for Neat and Tangled. eeek! You'll see more of the set on insta throughout the week, and Danielle (the store owner) will be showing off all of the new sets on the Neat and Tangled blog by the end of the week. Sorry I'm overdue for the last day of Just ME digital stamp highlights. I took yesterday off, mostly because the family went out in the morning and Sofia very kindly treated her siblings to hot chocolates at Starbucks. She ordered at the counter by herself, asked for their medium size and whipped cream too, please. We should have schooled her on how to order the "short" size, instead of the three "grandes" she ended up with. The kids were insane for the rest of the day. I have not seen a sugar rush that bad since Christmas. But she was so sweet about using her gift card to make them happy that we let them drink it all. Back to the stamps! The last image I'm showing off might just be my favorite. I love a floral, leafy wreath, and this one is heart-shaped just in time for Valentine's day crafting. The wreath has a beautiful presence, and doesn't take long to color because each leaf isn't very large. I love that! 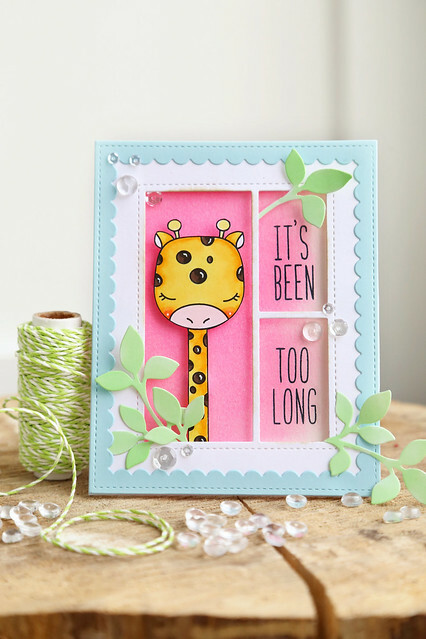 A few little dew drops from the Pretty Pink Posh store are the perfect embellishments. GIVEAWAY: leave me a comment and I'll choose a winner by tomorrow! Congrats, Elise! Email me at mom2sofia(at)gmail(dot)com to claim your prize! 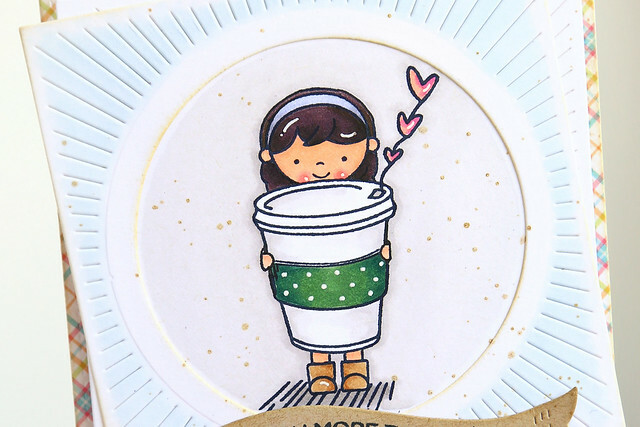 lawn fawn's CHA sneak week!